Do you feel ‘stuck’ in your life? Whether you feel stuck in your vocation, your relationship, your health, I have an inspirational guest today who’s got some great tips on how to ‘start over’. She is Instagram influencer and super star, Annette Hernandez-Duke. Tune in for tips on where you can begin to reinvent your life. Annette Hernandez-Duke has been a business owner since 1993. She is widely accomplished in bringing companies from start-up positions to multi-million dollar enterprises, employing hundreds of individuals across the country. A believer in giving back to the community, she occupies a position on the Board of Directors for the prestigious TLC Hospice Foundation whose mission is to provide financial support to improve the quality of end-of-life care for patients and their families. 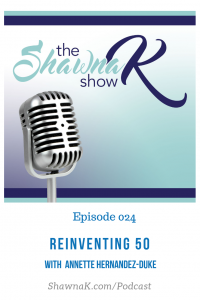 As the Founder of ReInventing50s, she is a Lifestyle and Beauty Brand Ambassador. Recently she’s transferred her skillset into a successful Rodan & Fields organization that has been successful in changing the lives of hundreds of women by helping them reinvent their financial lives. Annette has some tips for re-inventing yourself here.